The October Island Batik challenge was to make any size project using paper piecing, either EPP or foundation paper piecing. 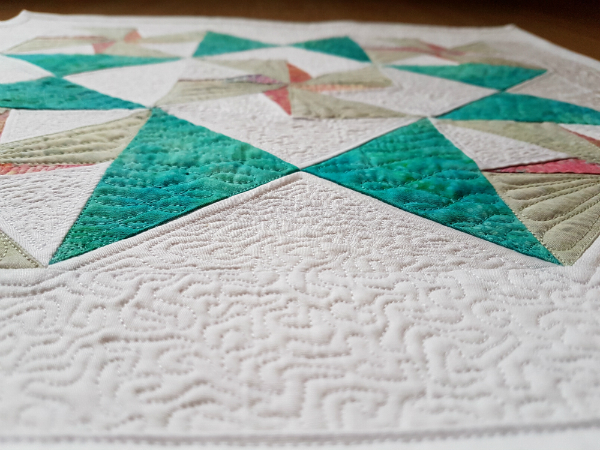 Since I already have two hand stitching projects on the go, I chose to do foundation paper piecing, using my Twirling Star pattern. The double pinwheel blocks are paper pieced, while the hourglass blocks are not. Twirling Star finishes at 19 ½" square and you can see the original version here. The two quilts look completely different! The weather has been gloomy and wet around here lately, so I had to settle for indoor pictures. Thankfully, it's much easier to take indoor pictures of a mini quilt than of a big quilt. 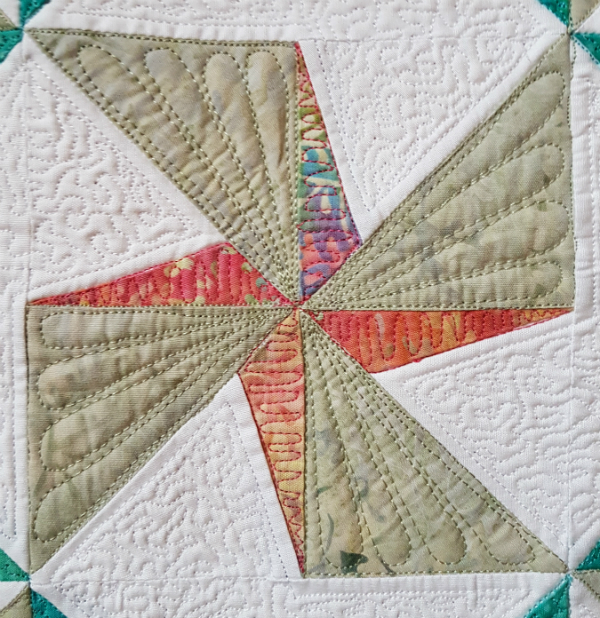 I modified the Twirling Star pattern slightly, choosing to have only one background fabric and to use that same fabric for the border. To be honest, this was mostly because I was working with 10" squares of the fabrics I most wanted to use, and I didn't have a good coordinate in yardage. But it worked out well, I think! I really like how the stars and twirling pinwheels stand out against the white background, which is also from Island Batik. 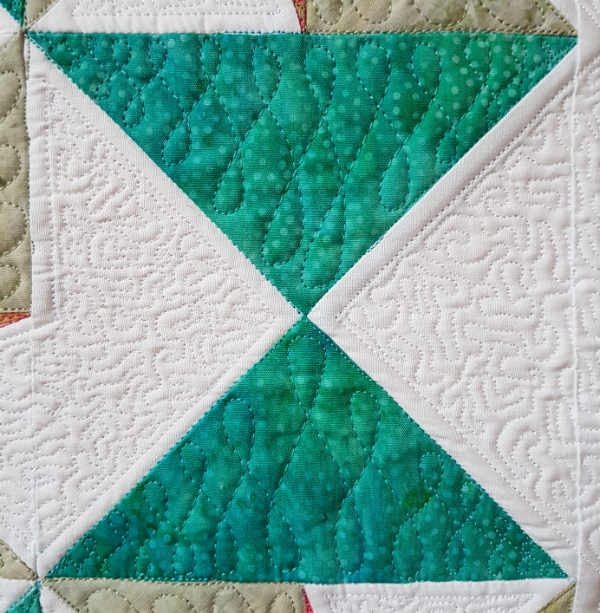 I was really mixing up fabric lines in this mini quilt. The star points fabric is from the Paisley Dots line and I love the gorgeous teal. This was the only fabric for which I didn't have a coordinating Aurifil thread, so the star points are quilted using Gutermann polyester thread. It was fun quilting these wishbones to fill the triangles, though as you can see I didn't always do a great job of keeping them straight. The smallest pinwheels are made from a fabric from the Victoria and Albert line, which was mostly pink, but there were a few spots of blue in the 10" square I had, so there are a couple of pinwheel points that kind of look like they're from a different fabric. My pink Aurifil (2530) doesn't blend in, but I like the contrast. The larger pinwheel fabric is from the Vintage Morris line. Aren't the subtle green tones beautiful? 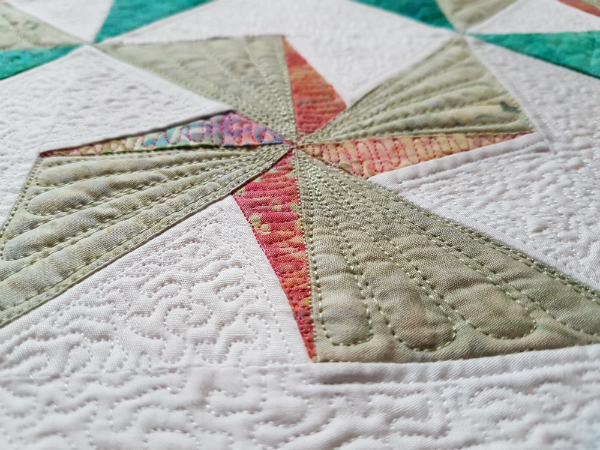 Both of the quilting designs I used in the pinwheels were super quick to stitch, which was really fun. 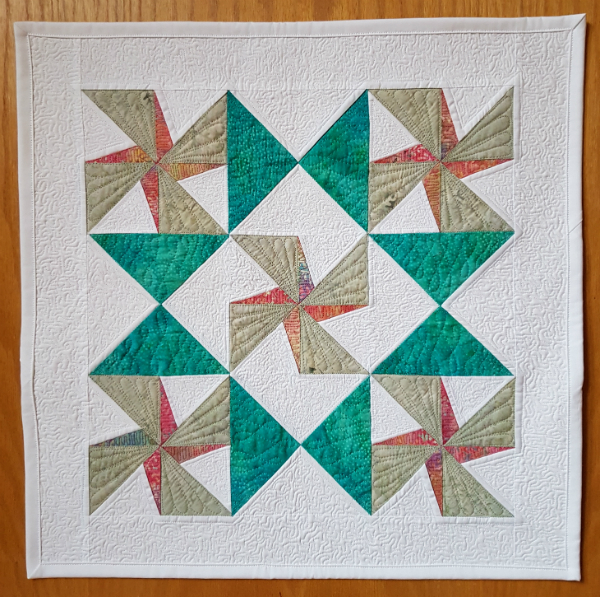 I used Aurifil 40wt in 2902 to quilt the green pinwheels. It was my first time using the 40wt and I wasn't sure if I'd need to adjust tension or anything, but my machine was perfectly happy stitching with no adjustments at all. I didn't have the matching 50wt thread for the bobbin, so I used a cream 50wt. I figured it would show up nicely on the back and I hoped it wouldn't poke through on the front at all, which it didn't. All while I assembled the quilt top and quilted the star points and pinwheels, I tried to decide how I would quilt the white background. Feathers? Swirls? Swirl hooks? Flow quilting? Nothing felt right. Then I thought of doing tiny stippling, which I immediately discounted because I don't particularly enjoy stippling, and there's quite a bit of background, even if it is only a mini quilt. The more I thought about it, though, the more it felt like it had to be the stippling. Sigh. At least I managed to do all of the stippling in two evenings, so that wasn't too bad. 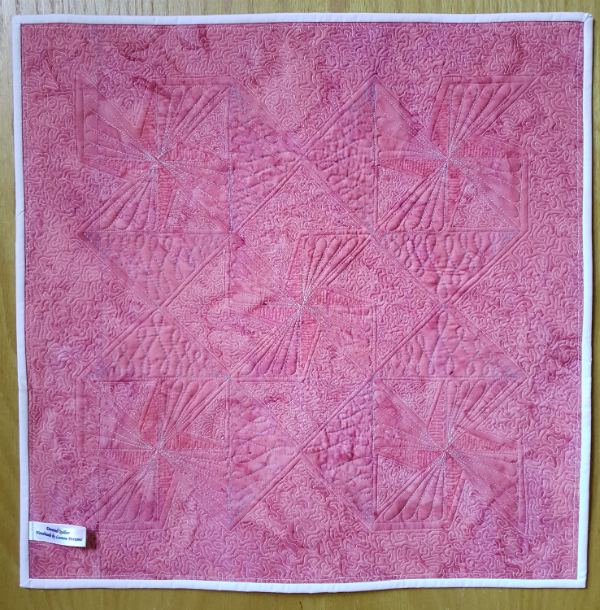 I used a pink batik from the Foundations line for the backing which was perfect for showing off all of the quilting. Sometimes I like the back of quilts just as much as the front! 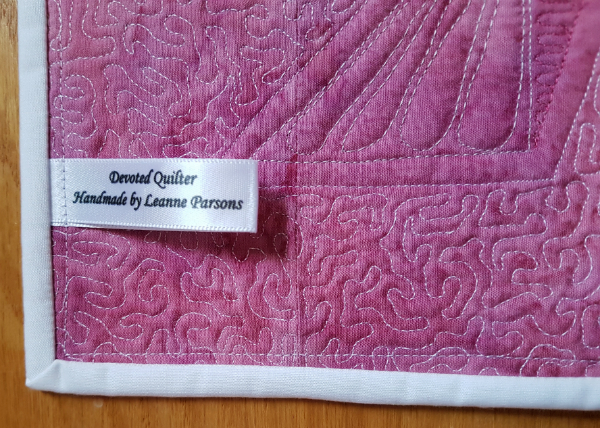 And of course, no quilt is complete without one of my labels 😊 I won these in a giveaway on Kelly's blog (My Quilt Infatuation) a couple of years ago and you'd still barely know I've used any. They are from Finer Ribbon, and there are 1000 labels on the roll, so they're going to last me a good long time, lol. If you'd like to make your own Twirling Star, you can get the pattern from either my Payhip or Etsy shops. The fabrics in this mini are beautiful. The quilting is really nice, and the photographs really make the quilting stand out. So pretty! Wow...they do look totally different. Good luck applying to be an ambassador again. The quilting really enhances the twirling. A very lovely mini! Those Twirling Stars are amazing!! You ended up with a beautiful quilt. 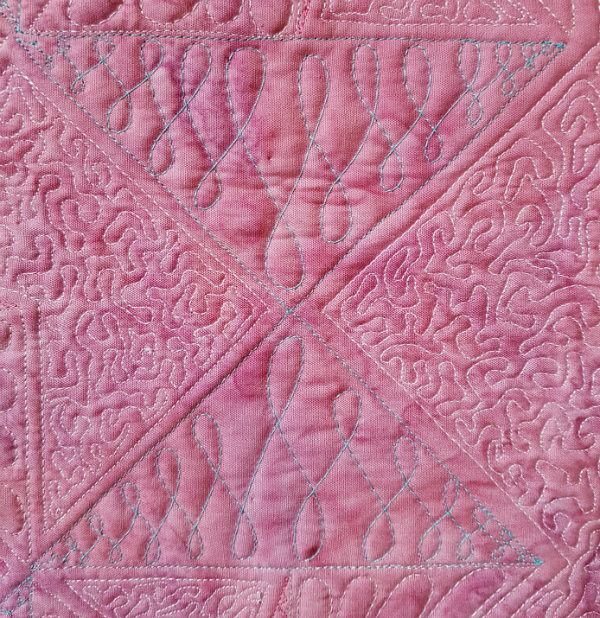 Love all the texture with the quilting too! Oh Leanne, your quilting is inspirational!!! Congratulations on a fabulous finish!!! 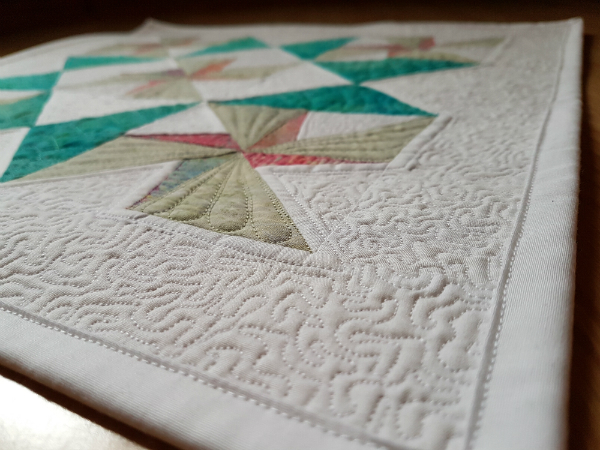 It's a beautiful finish Leanne and the quilting is gorgeous as well. I like that the wishbones aren't all straight. It gives it more character. I'm personally a big fan of devotedquilter blog. Thanks for sharing this post. I love this little quilt! This is a fabulous quilt and equally fabulous post! I appreciate the pics of 40 wt versus 50 wt. (I quilt on Janome's straight-stitch machine and use Gutermann 40 wt for quilting. I think the thicker thread is more forgiving and smooths out any wobbles.) 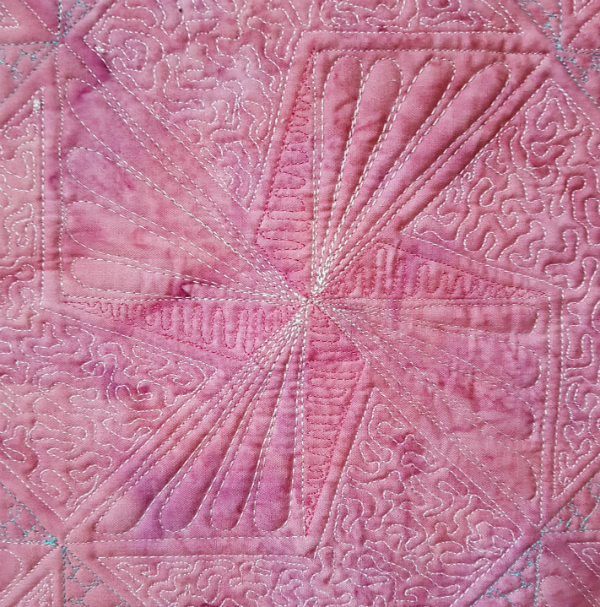 This is a great example of how the quilting elevates the beauty of a quilt! Great quilt, Leanne! I love all the movement you quilted into it! Great job!